Two weeks ago I wrote an opinionated blog post titled “When Even a Mug is Too Much.” Using that post as a model, I’m going to tell you everything I’ve learned, after 12 years of blogging, about writing opinions that people will listen to. Form an opinion. Don’t just copy one you saw on the internet. Let’s say you have a strong opinion about pit bulls. Humans are storytellers. We want to know why you have that opinion. Did you rescue a pit bull that everyone else was scared to adopt, only to have it be the most wonderful pet you could have imagined? Was your niece almost mauled by a pit bull? The story will serve as the heart of your opinion. In my mug post, I connected my opinion on sustainability to an incident in which my very liberal teacher brought a disposable coffee cup to class every day, and yet thought it was odd that I brought a reusable mug. The post should have two parts: the story section, and the opinion section. First, briefly write down the story. Then start ranting about your opinion. Write everything you’ve always wanted to say on the subject. I usually feel particularly rant-y right before bed. 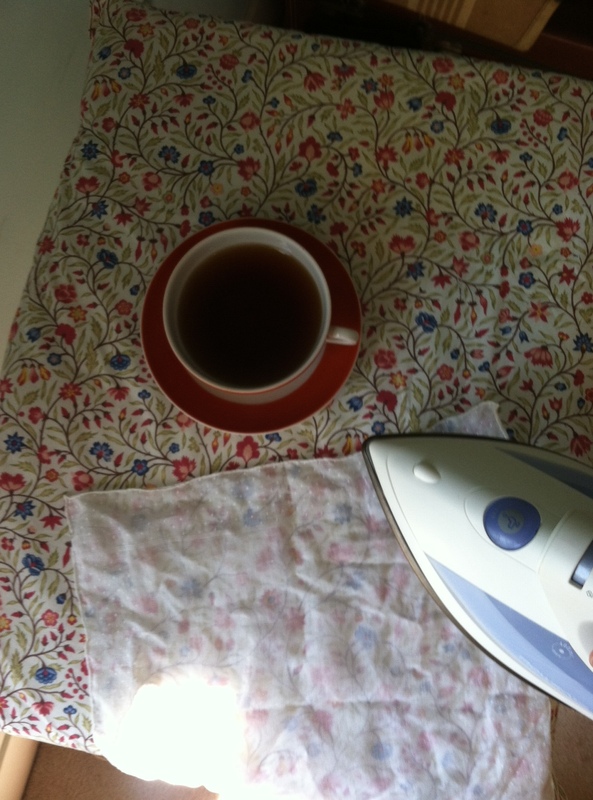 When I wrote my mug post, I couldn’t sleep because I was ranting in my head, so I vented to my blog. Then I saved it as a draft, to refine later. The story portion was 262 words long. The opinion portion was 459 words. People get so fired up about their opinions that they end up saying the same things over and over. This bogs the reader down. You want your opinion to be as sharp and concise as possible. The republican schrugged. “I still don’t buy it,” she said. Exhausted from trying to convince the republican, the democrat gave up. “Fine,” she said. “But when that bridge collapses, we’ll know who was right.” And in her heart she knew that morally, she believed the right thing. Democrats and Republicans, I’ve decided, are like two people who passionately argue about whether a bridge is structurally sound, and then both proceed to cross it anyway, because going downstream to the next bridge is too much bother. Say exactly what you are trying to say, and no more. Delete, delete, delete. I went from a 459 word opinion section to a 248 word opinion section. In the story portion, focus on telling the story well. What parts should you tell first? What parts are irrelevant to your opinion? What details will draw your reader in? When Trump won he came to class looking a bit shell-shocked, as though the world wasn’t anything like he’d supposed it to be, all these years. His daily dose of caffeine was in his hand, perhaps the only thing keeping him functional. One day he asked me about my mug. Why did I begin my story with my professor’s political affiliation? That wasn’t the most interesting part. I switched things up, and began with the actual incident. Opinions should be stated in as few words as possible, but sometimes we need space to craft our stories well. The story section of my mug post was 262 words long in the rough draft, but I expanded it to 358 words in my final published post. Other things to think about: Should I keep my story at the very beginning, or would it work better later on in the blog post? Should I use multiple stories to get my point across? Play with different options. When you write an opinion, someone will misunderstand you. That is a sad reality of life. Still, try to keep the misunderstandings to a minimum. Imagine your grandma reading it. Imagine your liberal neighbor reading it. Imagine your friend from elementary school clicking the link on Facebook and thinking about you again for the first time in years. What would be confusing to them? Re-word it. What would needlessly offend them? Consider adding a disclaimer. Granted, some people live very consistently with their values, and I respect that a lot. Publish your opinion. Refresh your computer screen until you get your first comment. Edit your opinion post to clarify the thing they misunderstood. Go eat a cookie. Come back and find that three people think you’re amazing and one person thinks you’re judgmental. Panic. Draft three responses to their comment before deciding to just let it go. Congratulations, you have published an opinion that people listen to. This has been day 22 of the April Blogging Challenge. 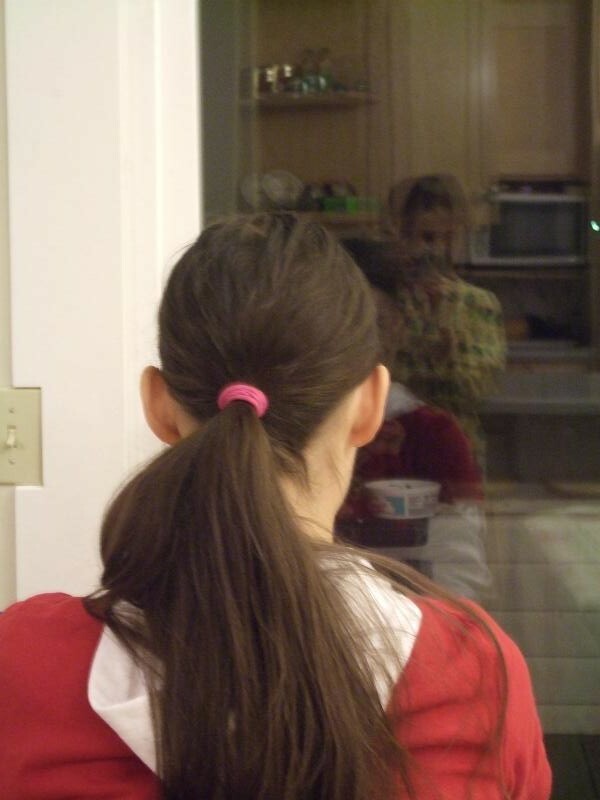 On day 20, mom posted about parenting teenage girls, and on day 21 Jenny wrote about things she wishes she could tell her younger self. 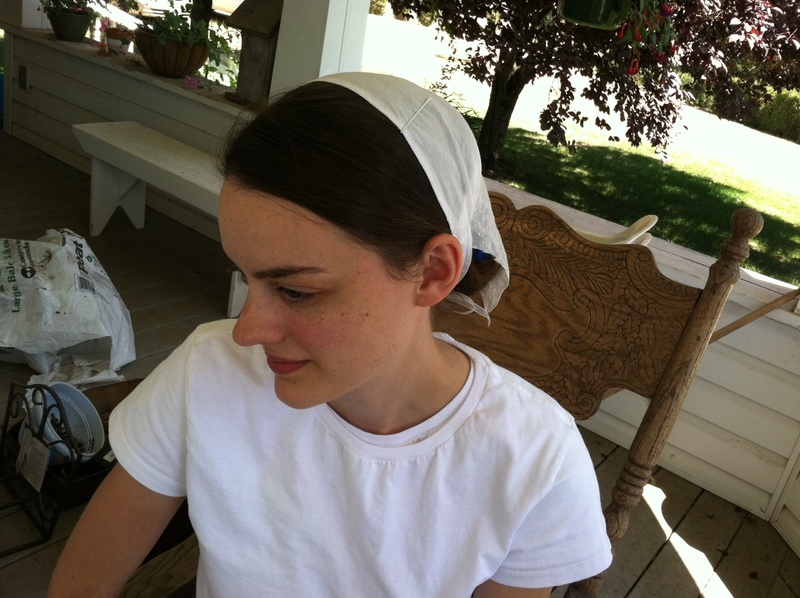 Have you ever picked up a vintage handkerchief at a garage sale, and tried to use it as a bandana-style head covering, only to find it much too small? You blew your nose in it instead? Well I tried to use them as head coverings, because they are so cool and vintage-looking. I found a way to modify them so that they work well, and I thought I would share this bounty of wisdom with you. Okay. All you need for this project is a handkerchief, some coordinating ribbon (I recommend grosgrain, because it isn’t as slippery, but I used this sheer stuff because we didn’t have any grosgrain) and basic sewing supplies. 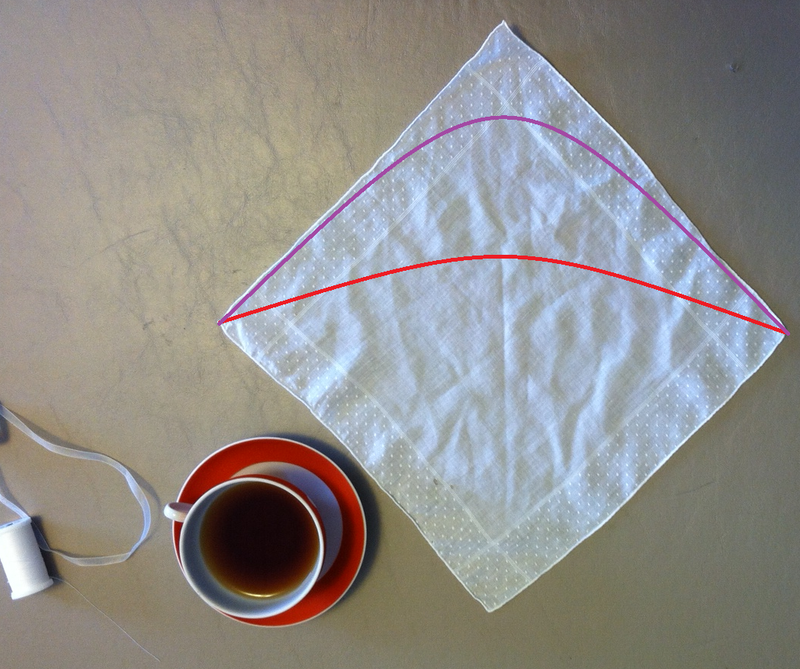 Now, using chalk or a pencil or something, draw a curve on the top half of your handkerchief. The higher the curve, the bigger the head covering will be, as illustrated by the red curve (small head covering) and the purple curve (large head covering). 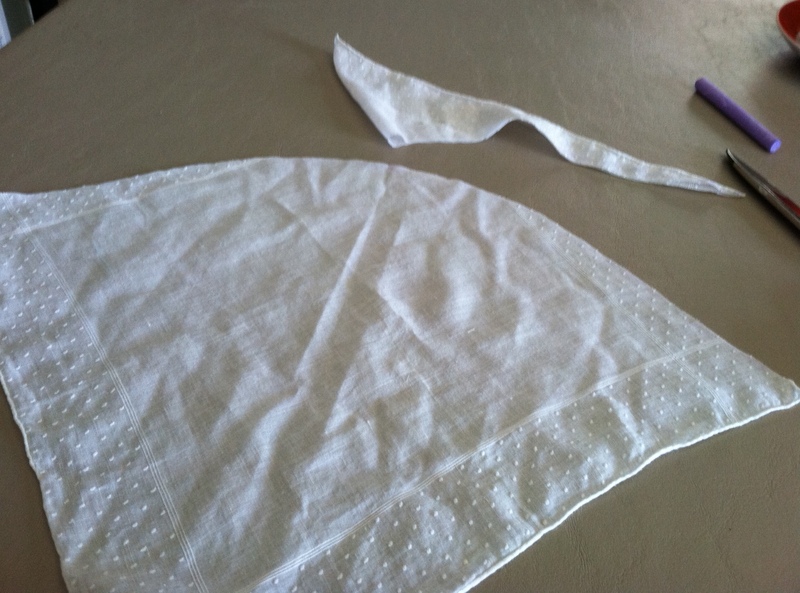 I folded the handkerchief in half to cut the curve, to make sure that both sides would be exactly even. Cut your ribbon into two pieces, about six inches long. I didn’t even measure. 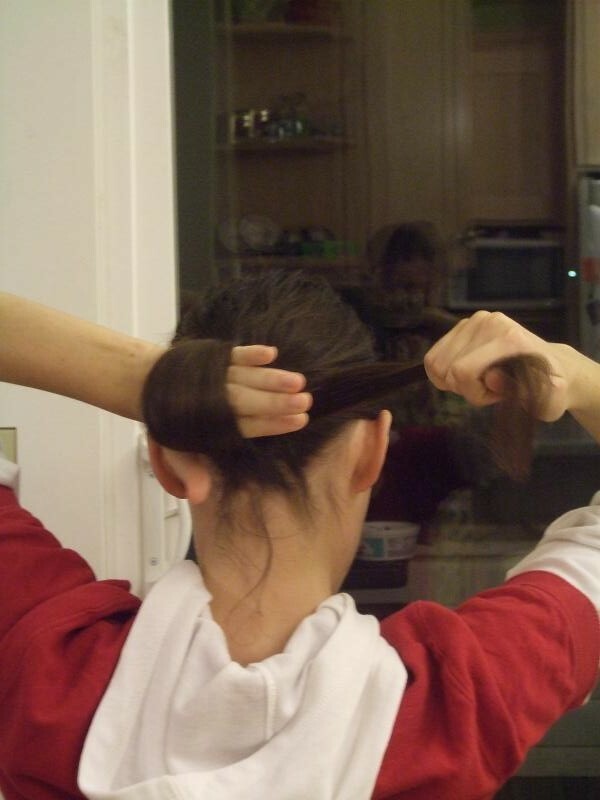 Long enough to tie into a bow easily. Now, hem it however you wish. 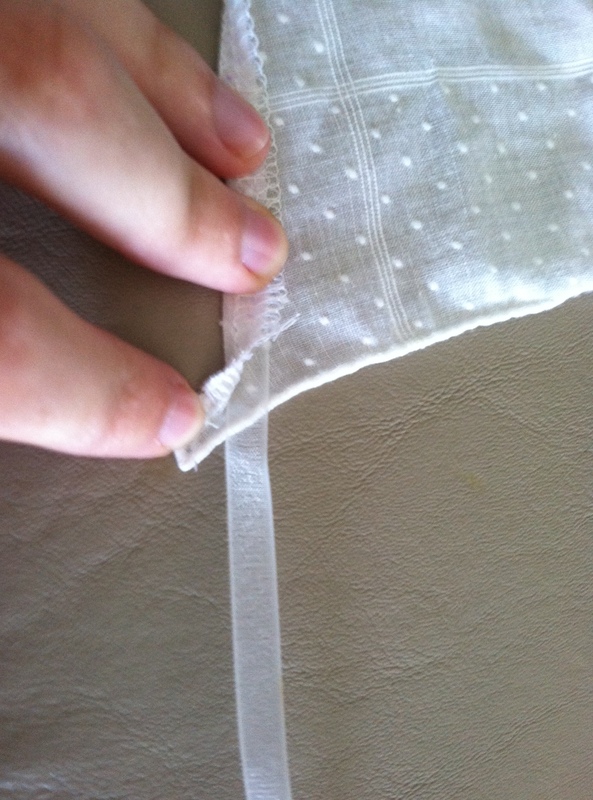 I chose to serge the edge, and then fold it over and hem, placing the ribbons in at the corners. 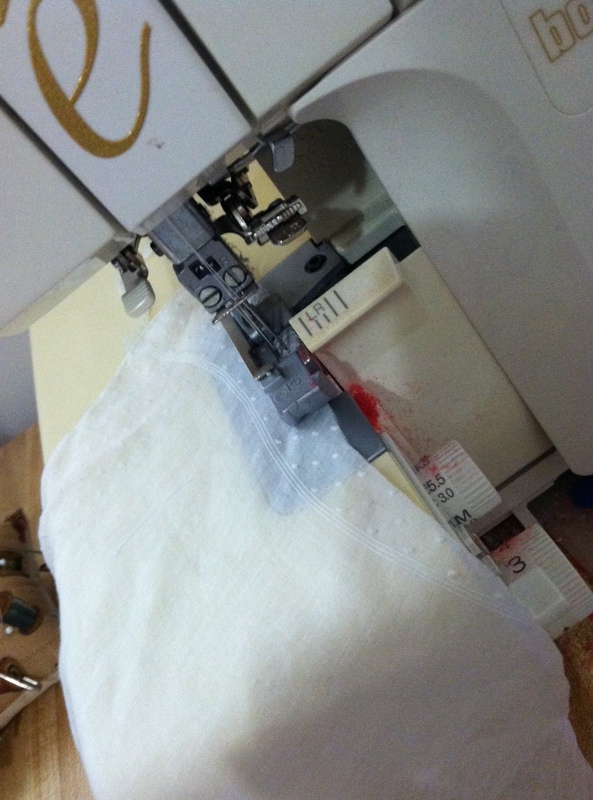 Is it just me or does the serger look like it’s bleeding? The ribbon should go under the folded edge, like this. 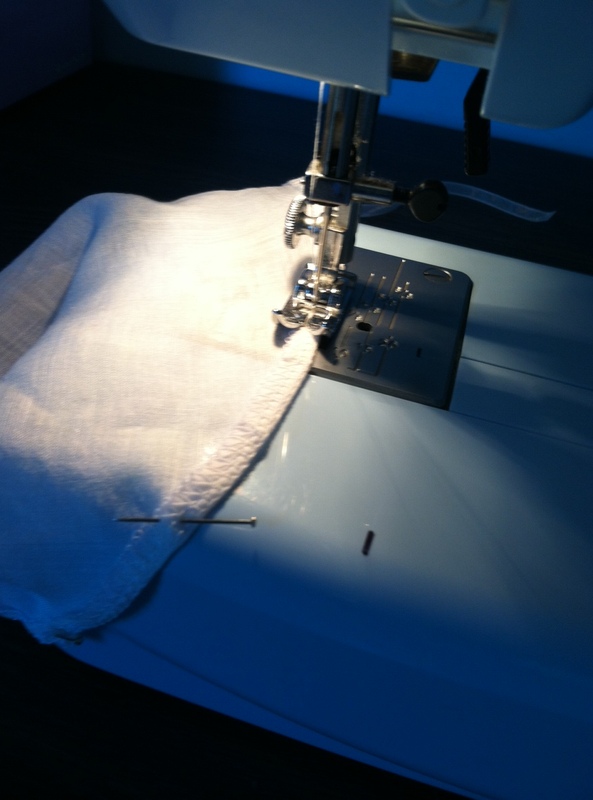 If you don’t have a sewing machine, just hem it by hand. 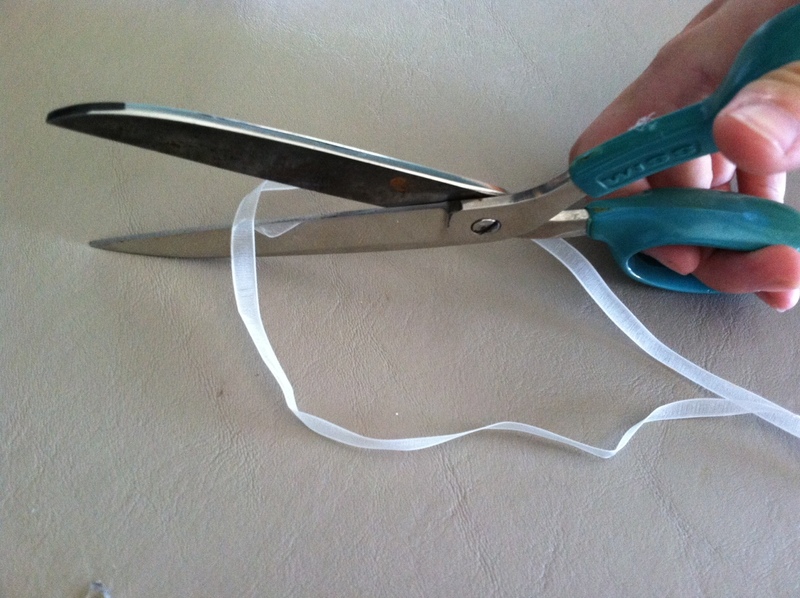 Trim the ends of your ribbons into points, and dab a bit of fray check, or clear nail polish, or Elmer’s glue, on the ends to make sure they don’t unravel. 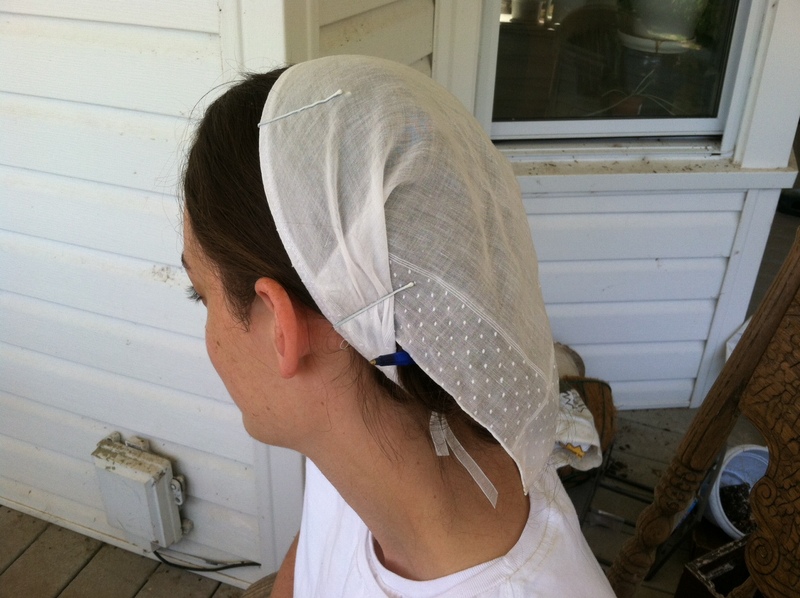 Now, iron your new head covering and use the ribbons to tie it onto your head like a bandana. P.S. If it grosses you out to put something on your head which someone once blew their nose into, just imagine that it was used, instead, to dab away a young damsel’s tears when her fiance went off to war, or something. Yes, this is my first tutorial. Ever. I think. Here we go: Emily Smucker presents…. 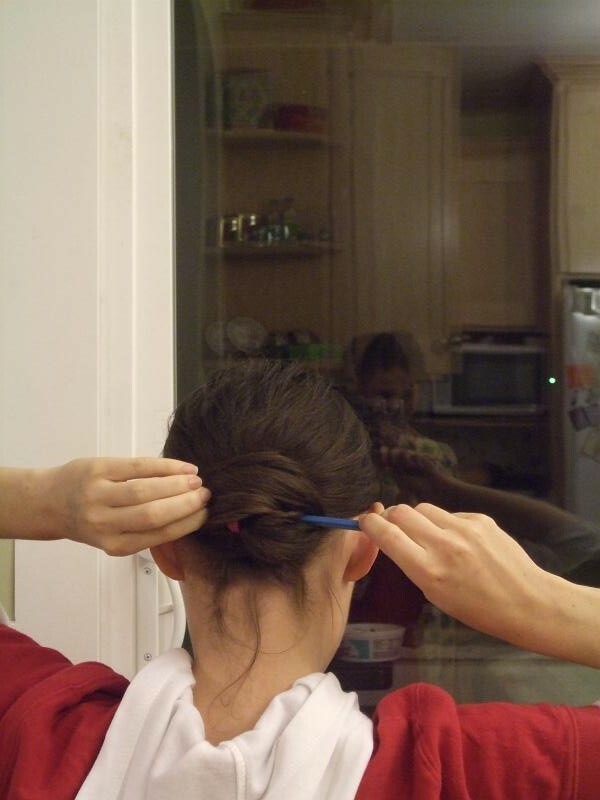 How to put your hair up with a pen or a pencil or a spoon or whatever long straight thing you happen to have on hand. 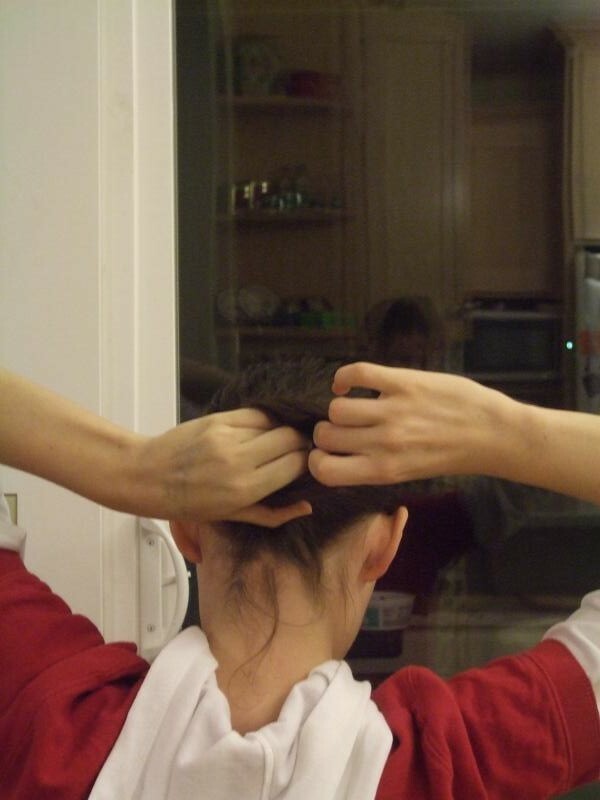 Step 3: Loop your hair up over the top of your hand. 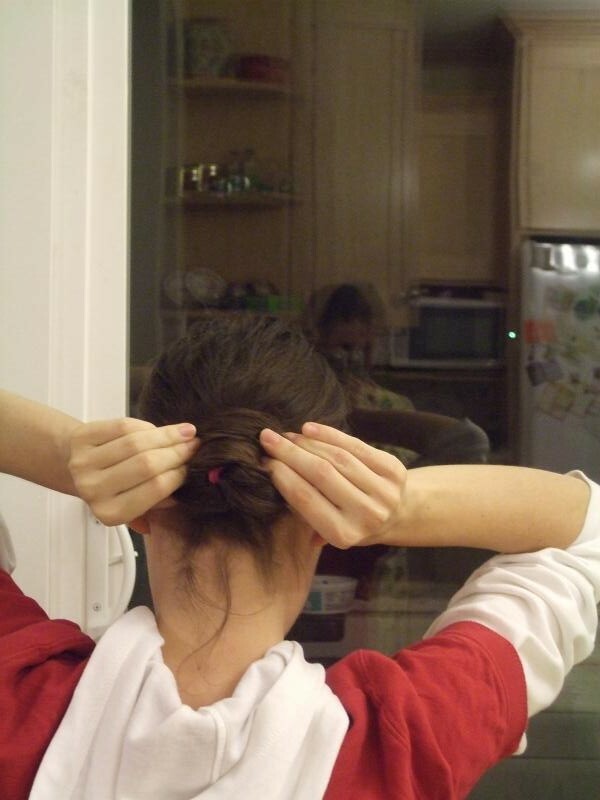 I wear my hair like this every day. 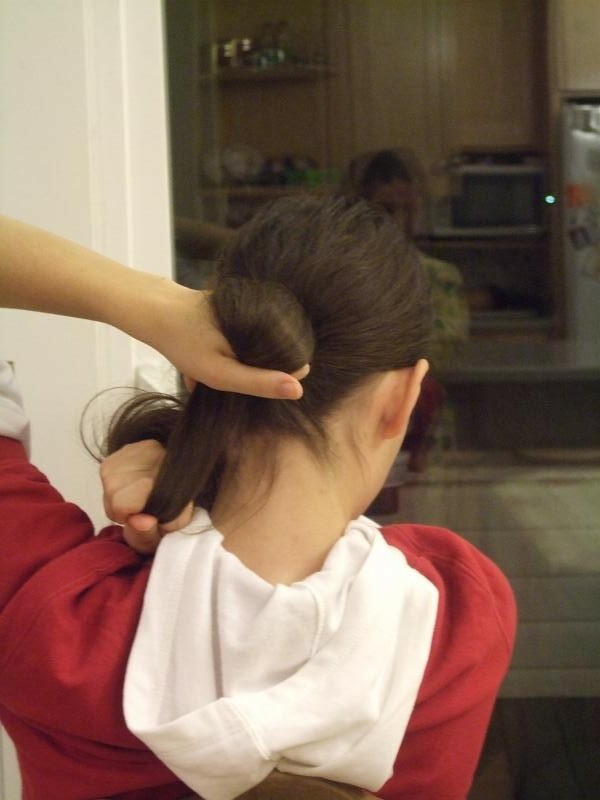 I never had the problems with my hair falling out once I put my hair up like a lot of Mennonite women do. 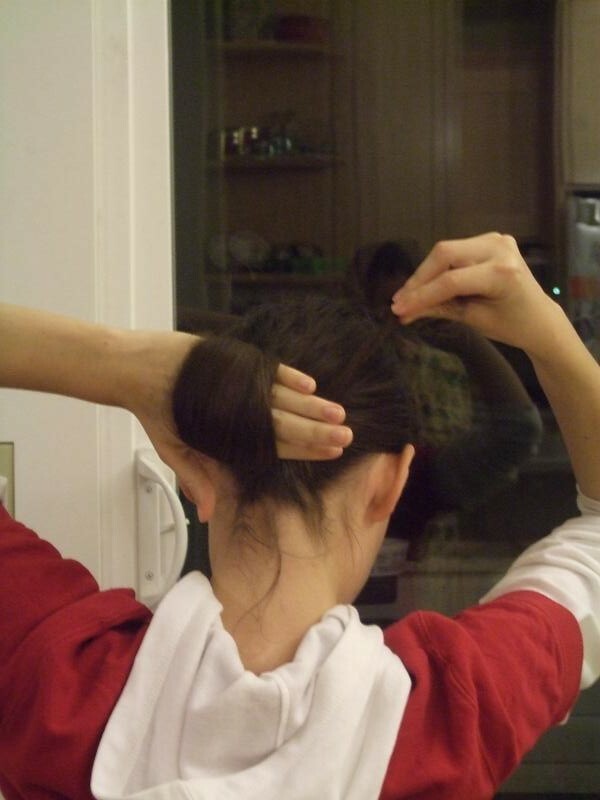 You can do this hairstyle without putting the ponytail holder in at the beginning. You can just hold it with your hand. 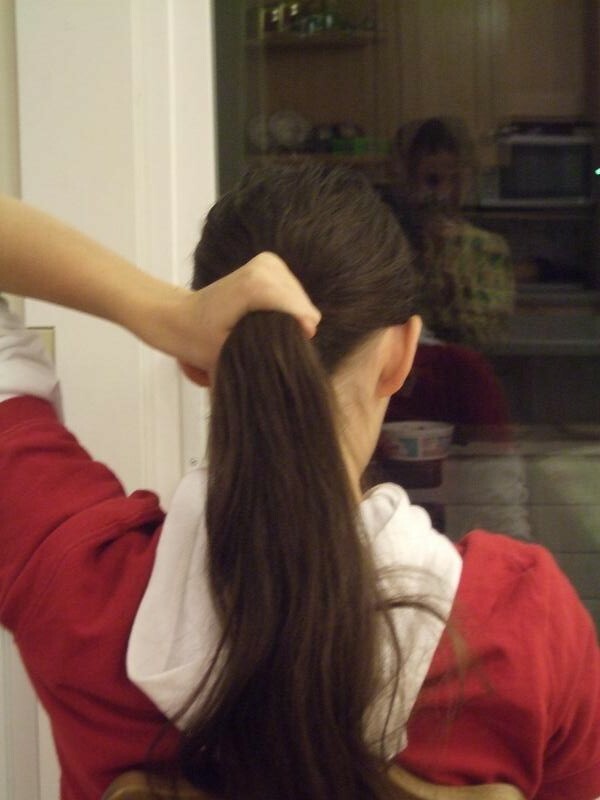 I did that for years and years but now I try to put a ponytail holder in it because it helps it stay up longer. This style usually lasts me all day. If it falls down, it takes approximately 12 seconds to put it back up. If you are wondering why there are those long-ish hairs at the nape of my neck, I will tell you. 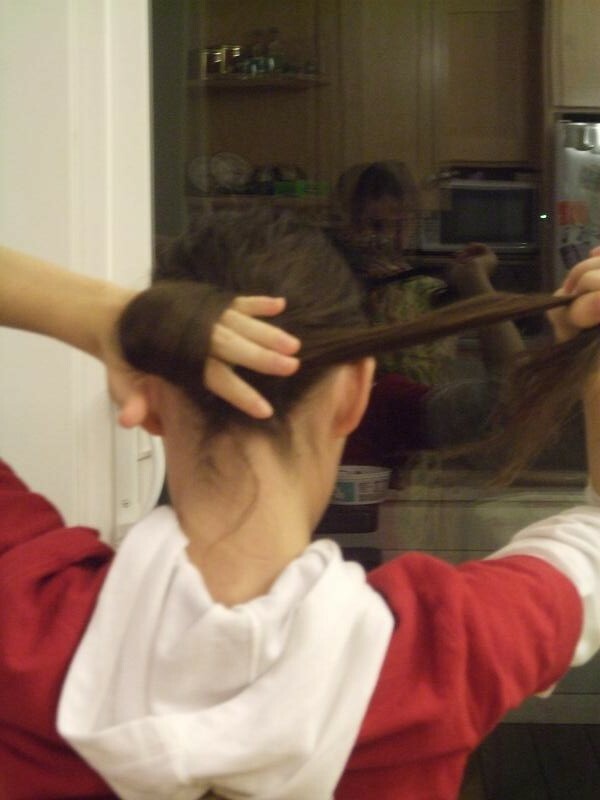 Once I did my hair in a whole bunch of little braids. When I got done I realized that there was a teeny strand that I had missed. So I ripped it off and then it grew back enough to just hang there without staying up in my bun very well. 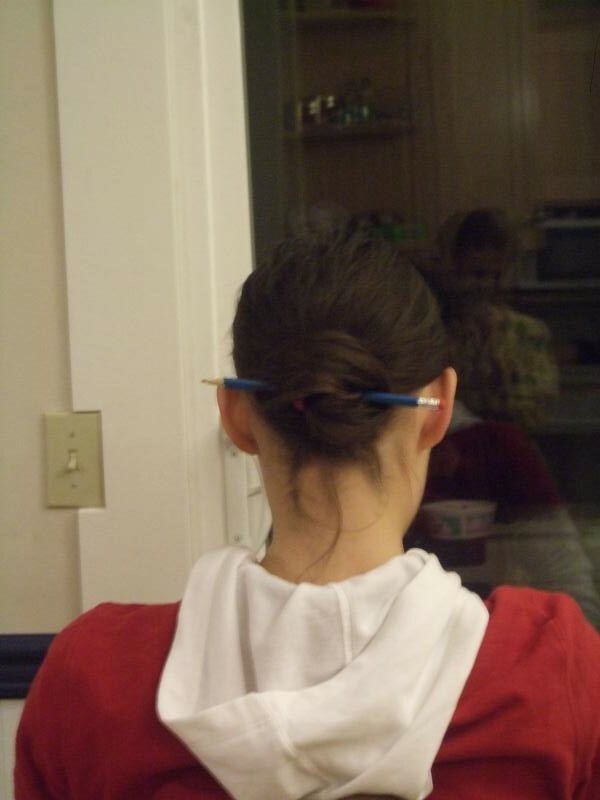 It is possible to put your hair up like this using a spoon, a stick, a knitting needle, a crochet hook, and any number of things. However, sometimes things like sticks and spoons are very hard to get in and out and cause lots of pulled hairs and are in general a big pain. I have never really liked kleenexes, actually. Why did mom always have to buy those little kleenex boxes to set in my school desk? Why couldn’t I just grab a roll of toilet paper from the bathroom like everybody else? Toilet paper is cheaper. And you can get a big piece or a little piece, depending on how much you need. But once when I was telling my mom all this, she proceeded to tell me about how, in her childhood, her friends would ask for a kleenex, and her mom would tell them to just use toilet paper, and she was extremely embarrassed. Something like that. So of course then I felt bad and never again complained about kleenexes. Well maybe I did. I don’t actually remember. I still don’t like kleenexes. Every time Mom visits me, large ugly flowered boxes appear all over the house, and I don’t know what to do with them. I suppose I could use them, but I’d much rather replace them with my latest craft obsession, homemade kleenex boxes. So easy to make. And fun. Get a coffee can or a reliv can or some sort of can that’s around the same size as a roll of toilet paper and has a soft plastic lid. Cut a hole in the lid, pull out the cardboard tube in the roll of toilet paper, and stick the roll in the can. 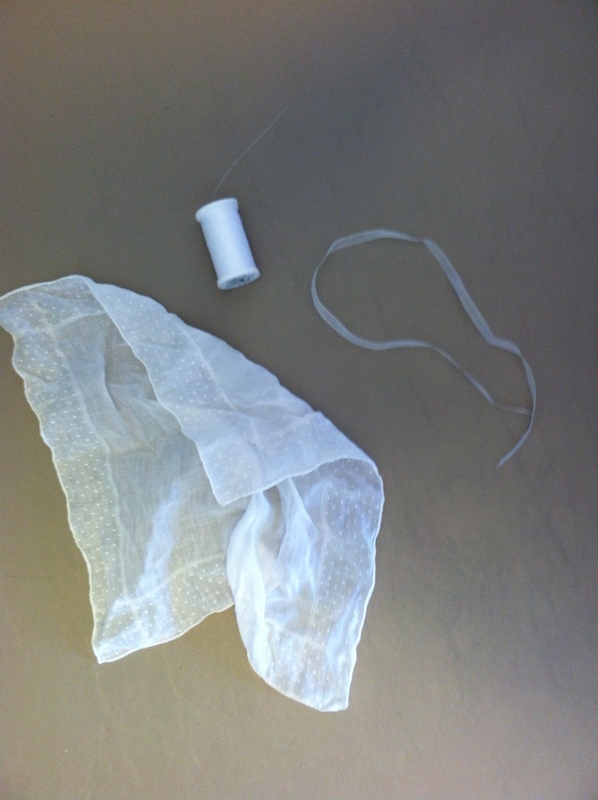 The paper should be pulled from the center of the roll and go out the hole in the lid. And fun. Cause you can decorate the can however you want. And you can refill it again and again, unlike normal kleenex boxes. And you have all the amazing benefits of using toilet paper. The first time I made a kleenex box out of a reliv tin it went very well. I had to unroll some toilet paper from the roll to make it fit in the can, but I just folded up the extra and stuck it in my bathroom and used it. But yesterday when I got a roll of toilet paper to put in my latest kleenex box I ran into a problem. 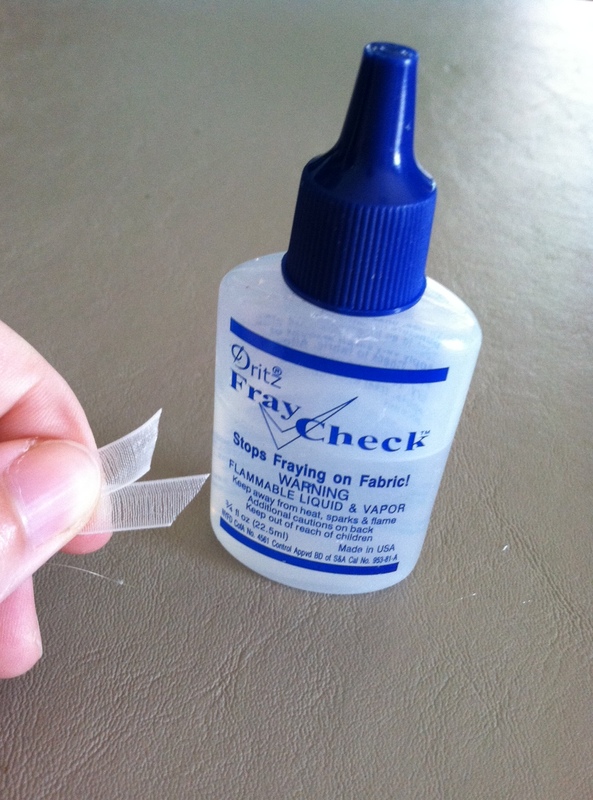 All I had left was this thin one-ply stuff like they have in gas station restrooms. Which meant that a LOT of toilet paper fit on that roll. So to get it small enough I had to unroll and unroll and unroll until I had piles and piles of extra toilet paper around me. So much that I got sick of trying to fold it up. And it seemed wasteful to just throw it away. So instead I tried to make a sort of paper mache out of it. I really have no idea how to paper mache. Like most craft projects I attempt to do, I made it up as I went along. I soked it in water and elmers glue and then tried to form it into something. Finally I made a sort of bowl. No idea how it’s going to turn out. It’s still trying to dry. I have so much fun layering my clothes and such to make them unique and modest, but that doesn’t work well in the summer. What I need is t-shirts. So today I took this Seattle Seahawks t-shirt my brother gave me that hung like a sack, and took it in. It was so easy. 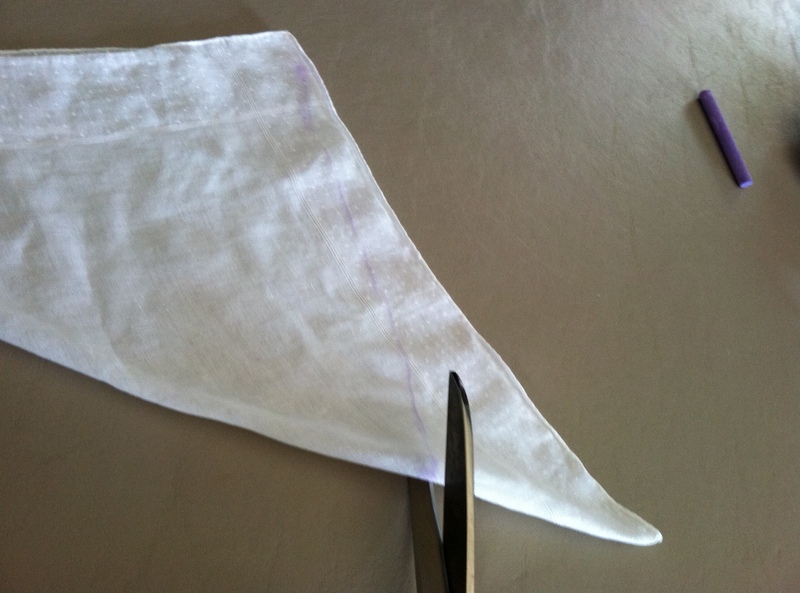 I just measured two inches in on the side from the hem to the tip of the sleeve, and surged it all the way. Now I have a t-shirt that fits me, is long, and doesn’t have those “itty bitty cap sleeves” that my mom detests so much.